I was introduced to gambling at a very young age. Almost dangerously young. Actually I would definitely say dangerously young as I just re-mortgaged my house to pay off debts to my bookie. That was a lie, but I did start gambling when I was about 6. I lived behind a convenience store during a large part of my childhood years and the owner graciously (foolishly?) allowed me to purchase tickets if no one else was in the store. Enough said. 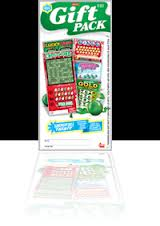 Every year for Christmas, I would receive a couple of the holiday gift pack lottery scratch tickets. A winner in every pack. Now, I never won more than 20 bucks, but still. I was 8. So it was a big thrill. Did your parents buy these for you? Do you think my mom and fake dad were horrible people for introducing me to a potentially life ending addiction so early in my life? Get at us! Getting them as a gift is one thing, being able to buy them is something else.